Cousin James showed me this great feature of Firefox last week. If you aren't using Firefox, you should be. Most mornings I open the same daily links to check various sites. I used to use my personal links page, but now I use the Open in Tabs feature. 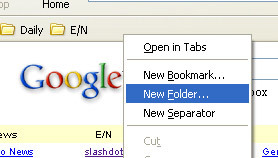 To get started, you make a folder in the Bookmarks toolbar by right-clicking and selecting New Folder. Name the folder something meaningful. 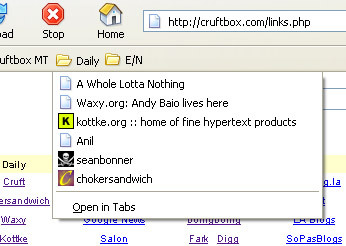 Next, drag bookmarks into the new folder so that when you click on the folder in the toolbar, you see the desired bookmarks. A just like that, all your desired sites are open and ready for browsing. Previous post: « Bunch of tea! Opera does this too. Very handy. There is all kinds of valuable stuff on this site! Thanks for the work!!! Yes, Firefox surpasses IE in many ways. Another cool way to open folders in tabs is to bind a button on your mouse to the "Middle Button" function found on a 3-button mouse. I have a scroll wheel that has a "button click" function on the wheel itself (most do). If you bind this to "Middle Button" in windows (Control Panel/Mouse), you can "Wheel Click" a folder anywhere in Firefox and it will open all the links in tabs. 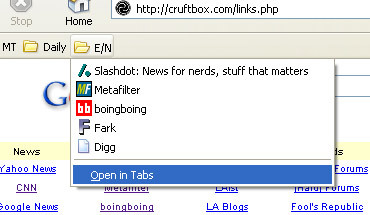 So, I have a bunch of "Link Folders" on my tool bar, middle click on one, and get all the containing links opened. Just a geek at heart, could not resist. You can as well do the same thing for your home page. Open multiple tabs, go to your preferences and then select "Use Current Pages" (The final S makes all the difference).